Home » Uni Updates » ARE YOU INTERESTED TO CALCULATE YOUR SWEAT RATE? Are you taking enough fluids during your exercising session? These are few tips to check out yourself that you are staying hydrated at every possible time. Since it becomes more necessary to stay hydrated during your exercising session or during hot weather it is important to replace the fluids that you are losing via sweating. Perspiration or sweating rate may vary from one person to other and also depending upon the conditions. Person A’s sweat rate may vary greatly when compared to person B. Thus, it becomes necessary to understand your own body and your own sweat rate. But, you may wonder is there any way to detect this sweat rate. The good news comes here that you can absolutely check out your own sweat rate using a simple and easy method. Doesn’t it sound interesting? For this you just need a bathroom scale. That’s it. And then you follow these three steps to calculate your sweat rate. Step on the scale before you start up your exercise session. Keep track of how much amount of fluids you drink while your exercising session. Weigh yourself after exercising and before urinating. (Remove your clothes if they are wet) Here comes the procedure for doing the calculations. Half litre of fluid weighs approximately one pound. If you weigh exactly the same before and after the exercise it means that you have done a good work. This means that the fluid losses were roughly equal to the fluid you took in before you started the exercise. In turn, if you feel one pound lighter it means that your sweat rate exceeded your fluid intake (you took before starting the exercise) by approximately half litre. For example, Let’s see the sweat rate of a person A while running using simple calculation. Thus, the person A loses 18 oz per hour while running. However, the sweat rate also differs during each climate conditions and also during each type of exercise. That means the sweat rate during the summer will not be same during the winter. Similarly the sweat rate will not be the same during running when compared to walking. Make a note of this too. Knowing your sweat rate will help to regulate your hydration levels and also keep on updated that you are properly hydrated by checking your urine, thirst and mood. If your urine is in dark yellow color with a strong smell that means that you are not properly hydrated and if you have dry mouth problem it is also because of dehydration. Also choose water instead of other soft drinks to bring down your thirst. Reduce the intake of caffeine since it results in dehydration. Often check your mood that you are light-headed or having headaches which are the symptoms of dehydration. However, some may be struggling without knowing how much amount of fluids to take according to their body range. Those people can take this sweat rate calculation to be clear about their own body and to determine how much fluid they lose and how much they need to replace during the exercise. Drinking enough fluids throughout the day is most necessary for the older adults. So, whom ever you are always keep you hydrated at very possible time. 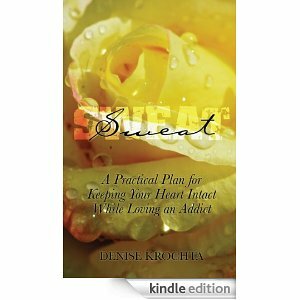 “Sweat.” It took a lot of this sweat and time for the author to develop this plan to get her life back, to recover from being addicted to the addicts in her life. Millions of us know the chaos that occurs in the daily lives of those who love addicts and alcoholics. Do we know fear, frustration, anxiety, distraction, depression? These become our lives. Focus? The author, who has had addicts in her life, most of her life, moved into crisis mode when she discovered that her teenage son was addicted to prescription drugs along with alcohol and street drugs. Hers is a story of discovery and recovery. The plan that worked for her, as she says “to get about 85% of my life back” is a simple plan. This plan is her contribution to hope, peace, and serenity for those who live in the midst of this chaos called addiction. Denise Krochta grew up during the 50’s and 60’s on the East coast of the US. She has a BA degree from Indiana University, Bloomington, in foreign languages. After college, her career in International Business took her to places around the globe. Travelling, meeting and learning about people and their values and traditions, have since been an integral part of her life. From her own experience and from her passion to support others cope and become stronger, she became one of the world’s top addicts family life coaches. Discover how Denise can help to support and transform your own life. So many of us would like to live our lives in a calmer and less stressful way, and be able to let go of our problems. This is the book that can show you how to stop letting the little things in life drive you crazy. 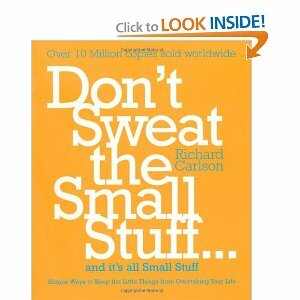 Dr Richard Carlson teaches us, in his gentle and encouraging style, simple strategies for living a more fulfilled and peaceful life. We can all learn to put things in perspective, and by making the small daily changes he suggests, including surrendering to the fact that sometimes life isn’t fair, and asking yourself, ‘Will this matter a year from now?’, Dr Richard can help everyone to see the bigger picture. Repackaged to inspire and guide a new generation, this is a Mind, Body and Spirit classic. I wonder how much attempt you place to make any such magnificent informative website.